Pityriasis rosea - WELCOME TO ERS 4 KIDS !! Acute and characteristic exanthema that starts as a plaque called a herald plaque. 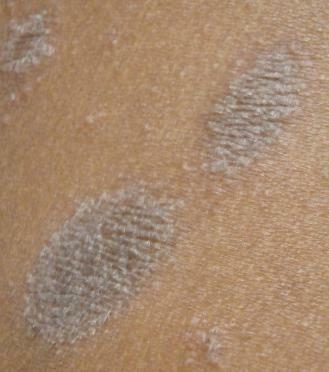 The patch is followed by a distinctive, generalized rash 1-2 weeks later. 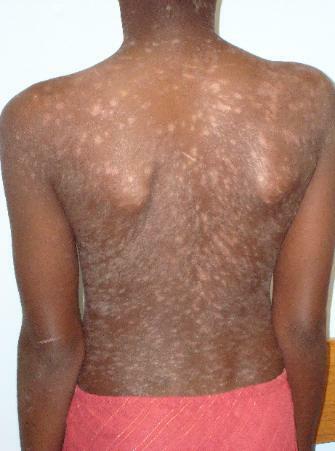 The rash lasts approximately 2-6 weeks. The rash follows the lines of cleavage of the skin. On the back, this eruption produces a "Christmas tree" pattern. Pityriasis rosea (PR) may have prodromal symptoms (e.g., malaise, nausea, anorexia, fever, joint pain, lymph node swelling, headache) that may precede the appearance of the herald patch. It is a self-limited disease, and treatment is supportive. Water, sweat and soap may cause irritation and should be avoided early in the course of the disease. Topical zinc oxide and calamine lotion are useful for pruritis. If the disease is severe or widespread (e.g., vesicular pityriasis rosea) topical or oral steroids may be used. Ultraviolet radiation therapy has been demonstrated to be effective for pityriasis rosea but may leave postinflammatory pigmentation at the site of the pityriasis rosea lesion. Acyclovir has been shown in one study to hasten resolution, especially if given within 1 week of rash but this was a nonrandomized nonblinded trial. The use of erythromycin (which has antibacterial as well as immunomodulatory properties) can also be helpful in some cases.